Christmas Is Not Over Yet! Stephen Renton and Michael Somerville Open More Presents! Two friends of mine are having Warrior Special Offers… Now as a WSO Insider, you know that preferential treatment is a given… but it isn’t because these guys are my friends on and off Facebook – it is because of their amazing products! Webinar Warrior on the loose! 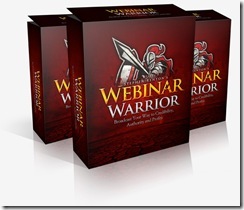 Best Selling Author Stephen Renton is release a Warrior Special Offer that reveals the inside information on how to make money successfully using webinars. If you have been looking for a way to stuff your pockets full of cash using inexpensive and free tools, Stephen delivers it at a very cool price point! And get this…this is all off NON-GOOGLE TRAFFIC. Which means, there is no hard labor involved!!! Michael even includes a COMPLETELY DONE-FOR-YOU funnel for a product that has proven to convert for him. Not only that, but he holds your hand every step of the way to help you set up your commission siphon as quickly as possible. Michael is a social marketing powerhouse, and he has helped connect me with tons of well known marketers via Facebook. His Facebook marketing course sells regularly for $497, and he is one of the few Clickbank vendors approved for up to $2000 products. These days it’s hard to get approved for anything even over $97 on Clickbank. The point is, he is an experienced marketer that knows his stuff. The price will be going up for sure on this killer offer from an underground internet marketing powerhouse…so don’t miss out! As always you can find out more at the WSOInsiders Fan Page! Greetings, fellow Warrior’s. My name is Ash (Major K), and I’ve been an avid consumer of Warrior Forum products for a while now. 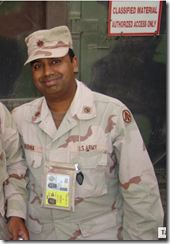 I’ve spent 20 years in the US Army as an Army Officer. Well, now that I’m retired (wow…have to get used to that word), I am making a go at the IM space on a full time basis. I need your help to stay busy folks. Having spent a career being very active and giving it my all, I need to channel that energy into a new career and I’ve made the decision that it’s going to be in the trenches with all of you. So, from one Warrior to another, I’m really glad to be here. Now, I’m not new to internet marketing, I’ve been on the net since 1997, and early on learned how to make an extra income with Amazon, Adsense, and Commission Junction. I thought for my first series of WSOs, I’d keep things simple. I’d start showing others where I started and that would be with good ‘ole affiliate marketing. Since Amazon has paid out something like 10 billion dollars in commissions, I didn’t want to reinvent the wheel here. In case you were wondering, this WSO is 2 Videos that you can use to promote Amazon products all year round! Veteran’s Day Warrior Special Offer Roundup! The Warriors are working hard to make sure you have a memorable Veteran’s Day! I know, this is a pretty large list, and if you were to purchase all of them you would be set back a niche bundle… but don’t buy them all! Choose the ones that further your particular business plan. Tim Atkinson is killing it with his new software product AzonSpy! The reason why he is doing so well is that it promises a great deal and the price is at an unbelievably low level during this launch. Search Amazon by category or keyword to uncover TONS of golden products that outsell the rest by a mile! AzonSpy skims for the most highly-reviewed, top-rated and HOTTEST products. Leave all those with just a few, measly, negative reviews for other affiliates to waste their time with. Azonspy lets you target the highest-commission products for FAT monthly checks that will launch you into 5-figure territory, FAST. AzonSpy will pull data from Google Keyword Tool to make sure people are talking about and searching for your products. AzonSpy let’s you quickly uncover all the available exact-match domains that you can use for your site. Hello immediate SEO nitro-boost! But that is only the beginning… because if you don’t know what you are doing, no software will be of any use to you! So Tim has included a training program that gives you the low down on how to make money with Amazon. This is worth the price of the software in itself, because you won’t get very far with the software if you don’t know what you should be looking for. Right now you are pre-purchasing the 2.0 version. You will receive version 1.0, and as they roll out updates, the software will have more and more features. The price was nice, because with Amazon, you get a percentage of the price the product sold at. But upon further investigation, the software also told me that this product is ranked 119,264th overall while the AR.Drone is ranked 413th with a price tag of $298.99! When you actually create your links, though, you find that the actual best price may be lower than what the software tells you. Personally, that does not bother me nearly as much as other people. When some affiliate marketers create a content post with the products that they are hoping to get the highest possible price. I am more excited by quantity sold, because my commission percentage goes up the more sales you make! If you want to get the research done on what is selling and what people are searching for on Amazon, then AzonSpy is the product you should be looking for!